Palette cleanser, much more clean, modern, airy draped over jewel tones in deep teal blue, jade and a royal purple. Active wear mixed with casual, soft and loose blazer and shorts. Socks & sandals. Technical fabrics with silk. A subtle mixture of luxury and masculinity without the jarring use of in your face logos Versace is known for. The prints were serving up more intricate Tiger of Sweden, the camo however was ok but not wow. It was either too small or the colors were not my thing. I did like that the traditional Japanese silhouettes were included and made new. The criss-cross espadrilles need to be on me now! However what really sold the collection was the Adidas collaboration. 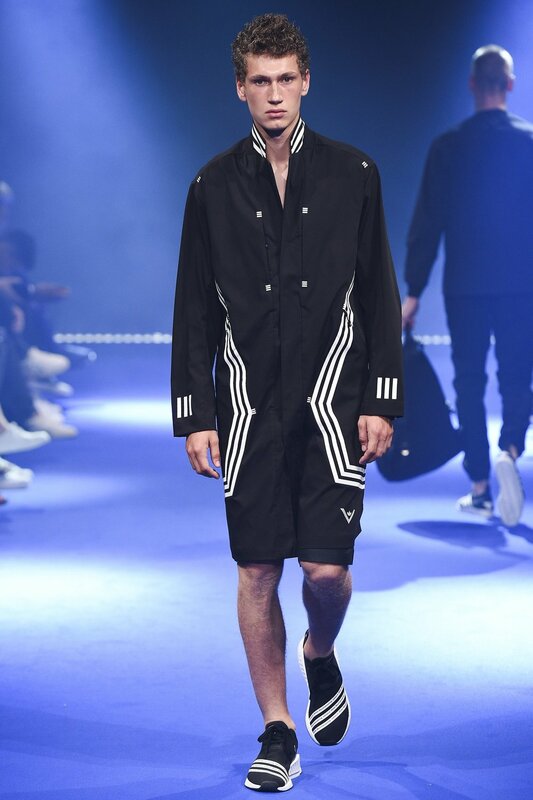 Move over Y-3 there is a new Japanese brand to bring it! The black/white was a stark contrast to the first half of the collection but works well for the collaboration and the retro-sport Adidas looks are also perfect. With the same feelings I have for Marni I also have always been a huge fan of the Korean brand and that hasn't changed this season! Their take on Sol LeWitt wall art works perfectly with the garments creating new ginghams and oversize checks. The fabric bases also made sense. Laxer cut trench coats, silk pajama style shorts and shirts, oversize bottoms where the draping allows the pattern to move, dense knit sweaters allowing for structured looks. Basically put it all on me! MSGM- Made me like actually argyle for the first time in my life. N.Hollywood- I'm a sucker for neoprene, I can't help myself. Rag & Bone- Very American silhouettes, workwear meets minimalist streetwear, clean vibrant primary colors. Rick Owens- Giving us some color and a new way of draping to his ever so billowy styles. The Kooples- New more laid back casual direction, boxier fits. more color and Japanese indigo heavy with a take on America approach.